Ships has been announced as the winner of the RTÉ Choice Music Prize Irish Album of the Year 2017 for the album Precession (Ships Music label). The judging panel, made up of Irish music media professionals, deliberated at length tonight before choosing the winning album. Ships received a cheque for €10,000, a prize which has been provided by the Irish Music Rights Organisation (IMRO) and the Irish Recorded Music Association (IRMA) – as well as a specially-commissioned award. The winner of the RTÉ Choice Music Prize Irish Song of the Year was also announced and Chasing Abbey won the prize for their song “That Good Thing”. Decided by the public via the RTÉ and Choice Music Prize websites, fans got behind their favourite song in big numbers. The sold-out event in Vicar Street was hosted by RTÉ 2FM’s Eoghan McDermott and was broadcast live on the station on a specially extended Louise McSharry show. RTÉ2 will broadcast a one-hour TV highlights programme of the RTÉ Choice Music Prize featuring performances from the acts and interviews by Bláthnaid Treacy on Sunday March 18th at 11pm. Earlier during the day, the inaugural “Conversations” took place at the Morrison Hotel, a music forum attended by international and Irish industry. The Irish Album of the Year 2016 shortlist can be listened to in full on the RTÉ Choice Music Prize website www.choicemusicprize.ie and on www.2fm.ie/rtechoicemusic. The winning album will be announced at the live event on Thursday 9th March. As part of the new partnership with RTÉ, the event will be broadcast live on RTÉ 2fm in a special four-hour extended programme from 7-11pm and on RTÉ2 as part of a special RTÉ Choice Music Prize TV programme, approximately one week later. The shortlist for the RTÉ Choice Music Prize – Irish Song of The Year 2016 will be announced on Wednesday 1st February, 2017 on RTÉ 2fm’s Tracy Clifford Show. A Special event featuring exclusive performances from Song of the Year nominees will be held that evening in Dublin’s Workman’s Club. The RTÉ Choice Music Prize is organised by David Reid. Irish Times music writer/critic Tony Clayton-Lea is the chairman of the judging panel. It is unique in that it focuses simply and solely on the music in judging the releases, as opposed to sales or airplay. The full list of judges is available on the RTÉ Choice Music Prize website http://www.choicemusicprize.ie. The 12th annual RTÉ Choice Music Prize will once again celebrate and acknowledge the best in Irish recorded music. The prize has become one of the highlights of the Irish musical calendar since its inception in 2005 and is awarded to the Irish Album of the Year, as chosen from a shortlist of ten releases by a panel of twelve Irish music media professionals and industry experts. RTÉ 2fm is celebrating the announcement of the shortlist across its schedule all day today with All Irish Music All Day from 6am to midnight, as well as live sessions by last year’s winner, Soak, and 2012 winners, Delorentos and a two-hour special on this year’s RTÉ Choice Music Prize, Irish Album of the Year 2016 shortlist, presented by Conor Behan from 8-10pm. RTÉ 2fm will continue to mark the announcement of the shortlist this week and beyond through a mix of airplay of tracks from the shortlisted albums, interviews with this year’s shortlisted artists and live performances. The shortlisted albums can be enjoyed in full on the RTÉ Choice Music Prize website www.choicemusicprize.ie. The winning album will be announced at the RTÉ Choice Music Prize live event, held in Vicar Street, Dublin on Thursday 9th March 2017. As part of the new partnership with RTÉ, the event will be broadcast live on RTÉ 2fm in a special four-hour extended programme from 7-11pm and on RTÉ2 as part of a special RTÉ Choice Music Prize TV programme, approximately one week later. Culture Ireland will fund the attendance of influential overseas Industry executives to attend the Choice Music Prize Live Event on March 9th while Golden Discs will feature special stands showcasing the RTÉ Choice Music Prize nominees across their stores nationwide from next month. The shortlist for the RTÉ Choice Music Prize – Irish Song of The Year 2016 will be announced on Wednesday 1stFebruary, 2017. A Special event featuring exclusive performances from both Album of the Year and Song of the Year nominees will be held in Dublin that evening in the Workman’s Club. Stay up-to-date with the latest RTÉ Choice Music Prize news by following @choiceprize, @rte2fm, @rte and @rte2 on Twitter and Facebook and @explorerte and @rte2fm on Instagram using #rtechoicemusic. For Snapchat updates, follow @rte2fm. It is unique in that it focuses simply and solely on the music in judging the releases, as opposed to sales or airplay. 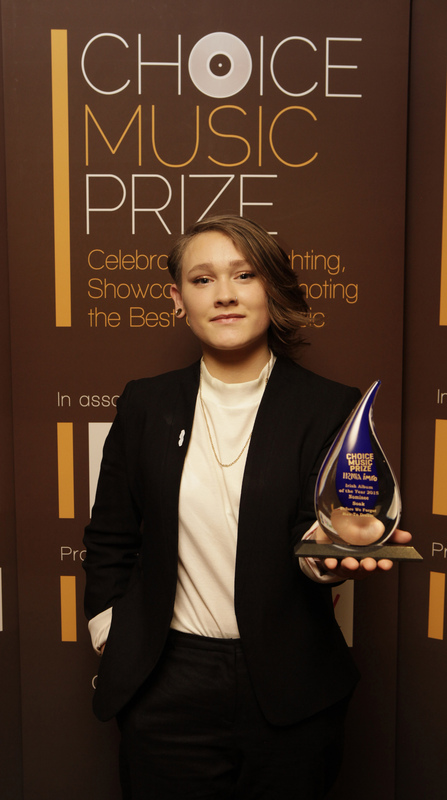 Soak received a cheque for €10,000, a prize which has been provided by the Irish Music Rights Organisation (IMRO) and the Irish Recorded Music Association (IRMA) – as well as a specially-commissioned award. The sold-out event in Vicar Street, Dublin was hosted by Today FM’s Paul McLoone and was broadcast live on the station on Paul’s show. The Choice Music Prize in association with IMRO and IRMA will take place on Thursday 3rd March at Vicar St, Dublin. The Choice Music Prize event will be broadcast live on Today FM in a special four hour extended programme during the Paul McLoone show. Tickets for the Choice Music Prize live event are on sale now from all Ticketmaster outlets and from http://www.ticketmaster.ie priced €25.50 including booking fee. The winning act will receive €10,000, a prize fund which has been provided by the Irish Music Rights Organisation (IMRO) and the Irish Recorded Music Association (IRMA). All of the shortlisted acts will receive a specially–commissioned award, courtesy of IMRO and IRMA. HMV are the official retail partners of the project. RAAP, Culture Ireland and Music Week are also official project partners. RAAP, HMV and Culture Ireland will co-host the Pre Event Reception which will be held at The Morgan Hotel, Fleet Street on Thursday March 3rd at 5.45pm. Project Partners are: Today FM, RAAP, HMV, Culture Ireland and Music Week. The Choice Music Prize, in association with IMRO and IRMA, today announces the shortlist for Irish Song of the Year 2015. The Irish Song of the Year shortlist is compiled by combining selected songs from the Choice Music Prize Judging Panel, Today FM, and the Irish Airplay charts as compiled by Radio Monitor. It is the public who will decide the winner by voting online at www.choicemusicprize.ie/song All voters are in with a chance to win tickets to the Choice Music Prize Live Event on Thursday March 3rd at Vicar Street and people can vote once a day until voting closes at midnight on February 28th. The winning entry will be announced at the Live Event and awarded the Choice Music Prize Irish Song of the Year trophy. The shortlisted songs will be profiled on air across Today FM The Choice Music Prize Live Event will be broadcast live on the night on the Paul McLoone Show on Today FM. Tickets for the Choice Music Prize Live Event are on sale from all Ticketmaster outlets and from http://www.ticketmaster.ie, priced at €25.50 including booking fee.